The longest stretch is Five-miles making for a ten-mile out and back. The LSCG can be connected to several other routes including Freedom Park. Void of serious hills there's really nothing difficult about the paved LSC Greenway. 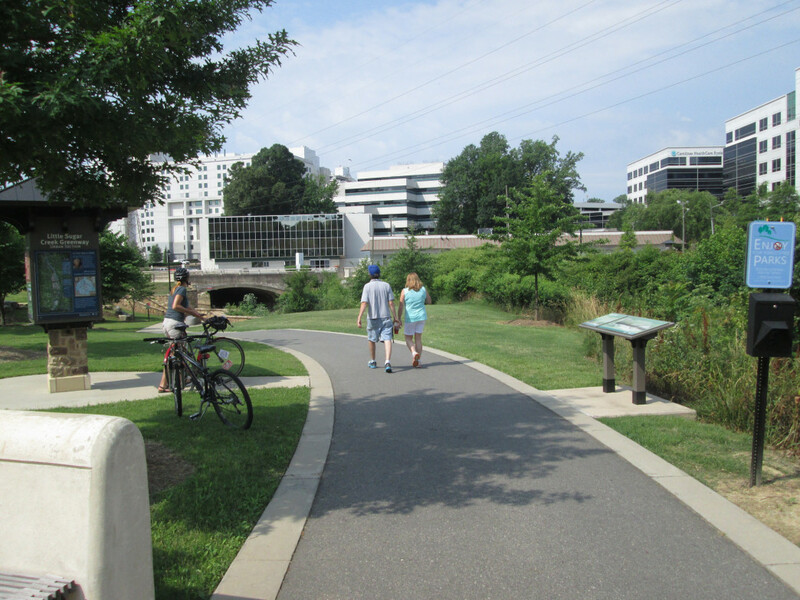 Little Sugar Creek Greenway is an ever-growing urban trail that begins to the northeast of uptown and continues, via broken sections, to south Charlotte. Part of both the Carolina Thread Trail project and the proposed Cross Charlotte Trail, The LSC Greenway could eventually be the centerpiece of an uninterrupted 26-mile link stretching from one end of Mecklenburg county to the other. Both a popular bike commuter path and workout route for area road runners, the LSCG gets plenty of use all year long. The Little Sugar Creek greenway is a plan in progress. There are currently four sections open with various city and county plans to connect, and extent the path much further. The longest stretch of this paved, urban trail, roughly five miles worth, includes two connected sections and runs from East 7th northeast of uptown to Brandywine Road in South Park. The trail skirts the uptown Charlotte loop, giving runners a fantastic skyline view. But there’s also plenty of points to be interested in right along the trail. Passing through Elizabeth, Thompson, Midtown, and Freedom Parks, there are several opportunities for green distraction. Park Road Shopping center and the Metropolitan connect runners with tons of post run food and drink options. And Charlotte Nature Museum and the History trail add chances to turn a morning run into a lesson on ecology and history. For a great way to spend Saturday morning, park at one of the small lots along Kings Drive, get your run in, then stock up on produce and meats at the Kings Drive Farmers Market. The hardscape greenway does a great job of providing a place to get in some morning miles with at least a little separation from uptown traffic. This is a true urban trail. For city lovers looking for a generally safe place to run, this section of Little Sugar Creek will suite them well. There are long stretches with little or no shade and the trail passes near the road in some areas. For a more tree-lined run, give the McMullen Creek Greenway a go. But for those looking for an off the street option for a run that puts you in the middle of everything Charlotte, Little Sugar Creek is your trail. As the LSCG parallels and crosses many roads, there are plenty of places to park and jump on. Freedom Park and the lots near Kings Road are two easy to use options. Parking at the Metropolitan means a start / stop point conveniently located at the doorstep of food and beer. Dogs are allowed on the trail but should be kept leashed. There are kiosks along the trail detailing things like bathrooms and points of interest.